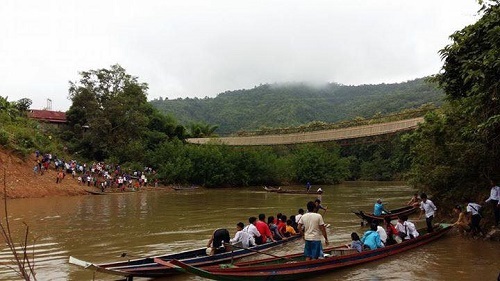 Two children have died, 52 people have been rescued and three children are missing after they fell into a river in Luang Prabang province on Friday morning when the slatted wooden bridge they were walking on tipped sideways.Fifty-seven schoolchildren, a teacher, and a motorcyclist fell off the bridge into the Xeng River at around 7am in Vangbay village, after one of the main supporting ropes snapped. Deputy Governor of Viengkham district, Mr Saykham Chanthoumma, told Vientiane Times on Friday that district authorities were riding around on boats trying to locate the three missing children. “Viengkham district will be responsible for any compensation payments and the cost of treatment at the provincial hospital. The district will ask high level officials about other ways in which we can help those affected,” he said. The Xeng bridge was installed in 2013 but was not opened to the public at that time because some aspects of construction were found to be substandard. After these problems were addressed, in 2015 the bridge was opened to people living along both sides of the river in Vangbay village. Mr Saykham said the ropes holding the wooden slats in position were torn and the bridge’s cables had not been checked for over a year. After some of the ropes broke, the bridge was unsupported and tipped sideways. He said old or broken pieces of wood had been exchanged for new pieces, but the cables had not been replaced. A Luang Prabang police officer, Mr Bounlay Xayavong, who helped many of the children to get to hospital, told Vientiane Times he was travelling to work in Viengkham district on the morning of the accident. When he and his friends arrived at the bridge, they saw a lot of people swimming in the river underneath. People living nearby the bridge immediately drove their boats to the scene to rescue the children. Mr Bounlay said he took many of them in his car to the provincial hospital in Luang Prabang town centre. Some of the children had broken legs or arms after falling into the water. “They could have sustained injuries after hitting rocks in the river when they fell from the bridge; some were coughing blood,” he said.